The CRANE Project shares its findings through multiple methods. CRANE joins with its partner, the Royal Ontario Museum, has a extensive public outreach program. Family Funday- Fare special festivals days at the ROM spread throughout the calendar year that are packed with lively, interactive, and engaging family friendly performances and activities that highlight fascinating galleries, exhibitions and research. CRANE will lead activations that will allow the public to access and interact with field and museum research. Using VR experiences, 3D visualizations, and interactive map simulations will create a barrier-free, accessible experience that will help the public understand archaeological datasets and how archaeologists use them to understand past human cultures. It will engage the public in the creation of hypotheses building, allowing them to ask questions of the data to create relatable interpretations of archaeological research. Visitors can discuss research with CRANE project members, and examine artifacts, digital images and visualizations. ROM Connects- From fascinating to thought-provoking, ROM Connects explore engaging issues and compelling topics. A series of talks presented jointly by the ROM and CRANE will explore existing and future provision and problems for professional archaeologists and the community using or interested in exploiting new media technologies for Public Archaeology and outreach work. 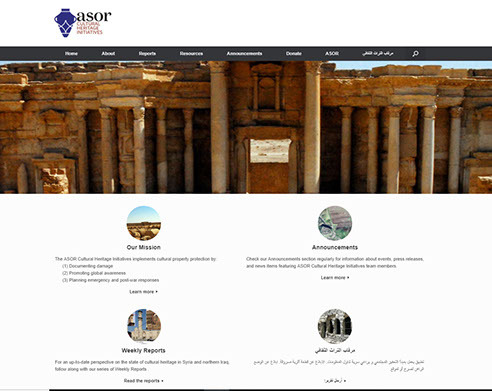 CRANE is also a contributing partner to the ASOR Cultural Heritage Initiative, providing data to help monitor, document, and verify damage and preservation to sites as a result of the Syrian Civil War. Several times a year, the CRANE team gathers to discuss findings, challenges and new approaches. These events are open to members of the public. Additionally, annual ROM Connects workshops explore engaging issues by means of a series of talks presented jointly by the ROM and CRANE which will explore existing and future provision and problems for professional archaeologists and the community using or interested in exploiting new media technologies for Public Archaeology and outreach work. As the project continues, directors of selected archaeological projects based in Canada, Europe, the Middle East, and the United States will be invited to participate in a series of workshops to explore issues of archaeological data management and large-scale data integration using the CRANE computational framework. Once established, CRANE’s database will provide a convenient resource for students and teachers as well as researchers. Data can be used to create materials that present and explain ancient evidence for university, secondary and primary school students. From the Internet, teachers and students will have access to a wide variety of textual and visual material from the ancient world, organized within a consistent and comprehensive framework.